It's great meeting students & teachers and sharing our music in such a fun, super-charged atmosphere. It’s a real rock show with energized kids of all ages, their friends & teachers having fun, moving, grooving, singing & interacting - spirits lifting & flying! It’s extra-special when schools have time to prepare for the excitement of the concert by listening to the music, getting to know the Lil' Band. Sometimes, classes design colorful signs quoting song lyrics, or they'll get dressed up in their hippest fashions for the show. Maybe they've learned to sing their favorite tunes or rehearsed a funky dance routine. Whatever it is, putting in the extra effort makes it a one-of-a-kind experience for all. In this post, you will find all the resources you need to prepare your class for a Little Band That Could show! We're so happy to share this video of a recent highlight. Filmed at the H.C. Johnson Elementary School, Jackson, NJ. Thanks to music teacher, Melissa O’Keefe. Editing by Ethan Noble. Photos by Ms. Garagiola. What an inspiring April day at H.C. Johnson Elementary School in Jackson, NJ! We celebrated Autism Awareness Month 2018 with our Love Me For Who I Am concert, and we were welcomed by an enthusiastic student body! Their extraordinary music teacher taught the students our songs, they prepared creative movements & even had a few surprises for us. The entire school explored the themes of acceptance, difference, love & celebrating all abilities and even made some cool signs: "Different is Beautiful!," "You Are a Rainbow!" This video is a perfect document of the joy, thrill, love & appreciation we feel when we visit a school and perform our music for such a loving, spirited, attentive & just plain AWESOME audience! Enjoy! 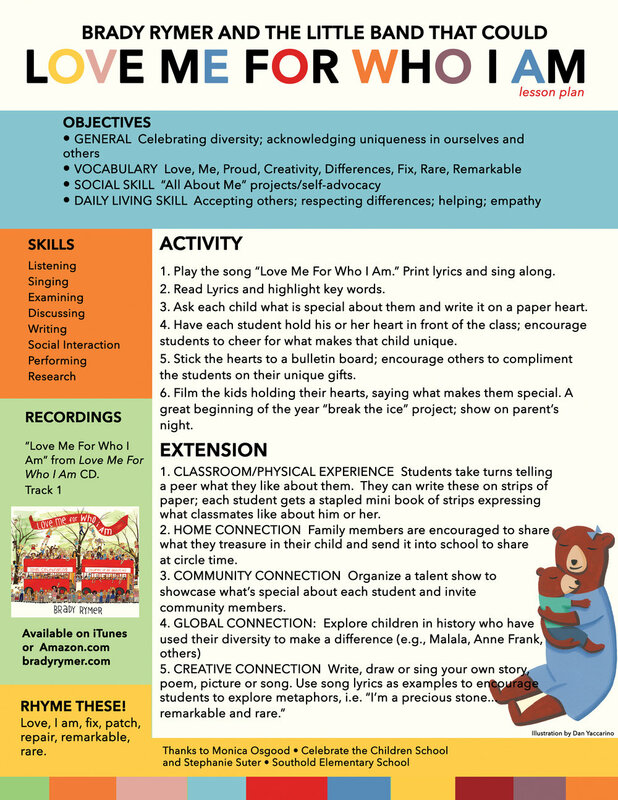 ROCK YOUR SCHOOL PLAYLIST on SOUNDCLOUD & Work with our song lesson plans in the classroom! Thanks to ALL the AMAZING schools we visited in 2018! You all rock! Kossmann Elementary School • H.C. Johnson Elementary School • Crawford-Rodriguez Elementary • Lynbrook Kindergarten Center • Roslyn Heights • Oakwood Primary • Mount Sinai Elementary • Celebrate the Children School • Early Childhood Center at Temple Shaaray Tefila • Ridge Road School • NYC schools participating in The Big Umbrella Festival celebrating Autism Awareness Month at Lincoln Center: PS 176, Richard Hungerford School and Manhattan Star Academy. The Songs Across the Pond Tour is a wrap!